A refreshing marine bath bomb creates an invigorating and aromatic bath, especially when used with bathing salts and specialty soaps. Nestled in a personalized crate, this gift will be cherished long after Valentine's Day. Lavender Bathing Salts, Marine Bath Bomb. La Lavande Grenadine Bath Soap, Exfoliating Loofah. Mini Heart Rose Petal Soaps and more. This gift is packaged to safeguard the shipping process and arrives presentation-ready. A free card is included with your personal message or greeting. Free Engraving! Complete the personalization option at checkout and we'll engrave your chosen message on the lid of this keepsake crate. Two lines, up to 36 characters each. 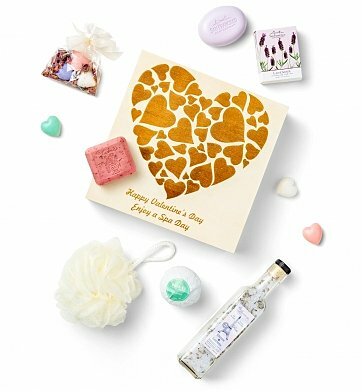 Valentine's Day Spa Crate is a hand delivered gift. These gifts are delivered by one of our local design centers located throughout the United States and Canada. Same day delivery is available for most gifts when ordered before the cutoff time. The cutoff time for Valentine's Day Spa Crate is in the recipient's time zone. Marine Bath BombNatural minerals in this sea-inspired bath bomb aids in relaxing tense muscles and detoxifying skin. Drop one in the bath for a fragrant and soothing experience. La Lavande Mini Heart Soaps with Rose PetalsMade in Provence. These pure and natural French soaps are made with enriching oils (shea butter, sweet almond, olive & palm oil) with no petroleum or animal products. They're moisturizing, beautifully scented, provide luxurious lather beneficial for all skin types, especially dry or sensitive skin. Your Valentine deserves a relaxing, soothing retreat.